Cooking schools are an often-overlooked location for workplace violence. Because cooking schools work with people from many walks of life, an incident response plan is a must. For this reason, a notification alarm from CRS Notify would be an essential supplement for any incident response plan. Why Use a Notification Alarm for a Cooking School? The reason for this is two-fold. First off, a cooking school could have many people working in one place, or it could have just a few. Either way, the threat of workplace violence is paramount in this kind of situation, whether it is a co-worker dispute or an active gunman making their way into the vicinity. Another reason to use a notification alarm for a cooking school is in case of threats. We, unfortunately, hear of dangers of this kind of nature every day. It is sometimes hard to tell which threats are real and which threats are empty. For this reason, the use of a notification alarm from CRS Notify is essential. The CRS Notify notification alarm for cooking school connects directly to 911 via E911 platform integration. In other words, police are alerted immediately in the event of an alert being raised. This cuts down on the response time when seconds matter the most in an emergency. What is the Benefit of a Notification Alarm for a Cooking School? One reason a notification alarm for the cooking school would be useful would be to contact others within a short distance. Perhaps an employee feels uneasy about an unruly client on the phone. The employee could raise a low alert, letting colleagues know of the incident as it unfolds. Another reason a notification alarm for a cooking school would be useful would be in the case of imminent danger to staff. A high alert should only be raised if it is safe to do so. Again, the E911 platform integration dramatically cuts down on the response time when seconds matter the most. Unfortunately, threats to a cooking school are a part of the job. There is no way to figure out a way to sift out the empty threats from those that are legit. An excellent way to help in this context is to keep up with every threat that happens. The use of low alerts from CRS Notify software would be beneficial in this kind of situation as well. An incident response plan should also be in place. What should staff do in case of a threat over the phone? Should they raise a low alert, alerting a supervisor to the situation? Or should they keep up with a list of these situations? What about in case of an active gunman? Should the cooking school staff shelter in place, or should they make their way out the door? A notification alarm from CRS Notify would definitely help in this kind of situation, but it is useless if the staff does not know how or when to use it! For this reason, the notification alarm would be an excellent supplement to any kind of incident response plan. In conclusion, a notification alarm for a cooking school is an excellent addition to any incident response plan. The E911 platform integration dramatically cuts down on response time during an emergency when seconds matter the most. The CRS Notify notification alarm for the cooking school will help anyone in the who works in a cooking school feel safe while doing their everyday job. Still Unsure About a Notification Alarm? Contact us for more information to make the best decision for your notification alarm. 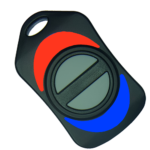 CRS Notify even has a low cost wireless button that covers an amazing distance. With our no obligation free trial see for yourself how much CRS Notify can help you or your business. The new crs notify panic button system runs on your computer, with optional hardware panic button, you can be up and running in less than 10 minutes and plans starting at $18 per month. Try a FREE TRIAL now. Have you ever had any of the following happen to you? • Scared at work or home? • Customer or client make you uncomfortable? • Need a low cost solution that can be installed yourself in less than 3 minutes? This was why we created CRS Notify. It is a computer based panic button that can be setup in less than 5 minutes and is very affordable. With optional hardware panic buttons that work wired and wirelessly. You now have the perfect solution for taking care of the people that care for you. Try our no obligation FREE TRIAL and see what everyone is talking about! How does CRS Notify Work? 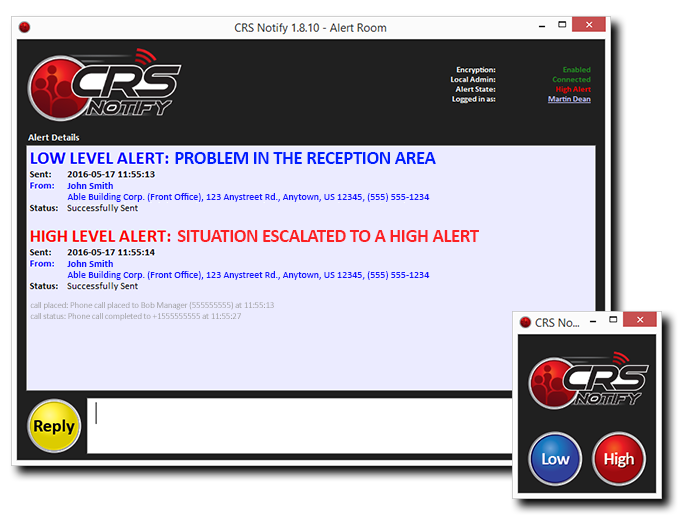 CRS Notify is a small program that runs on your computer with optional hardware buttons that allow you to raise high and low level alerts that reach out to those you need by computer, text, email and phone. The most amazing part is the price. Instead of costly monitoring programs leverage your existing resources and lower your monthly costs. Try CRS Notify today with our FREE TRIAL and experience the difference. With CRS Notify's low cost USB Panic Button you can now have a panic button that is easily installed by yourself that you can control. Try it today and see the difference.